Joel Embiid had a season-high 42 points to go along with 18 rebounds and four blocked shots to lift the Philadelphia 76ers past the visiting Charlotte Hornets 133-132. 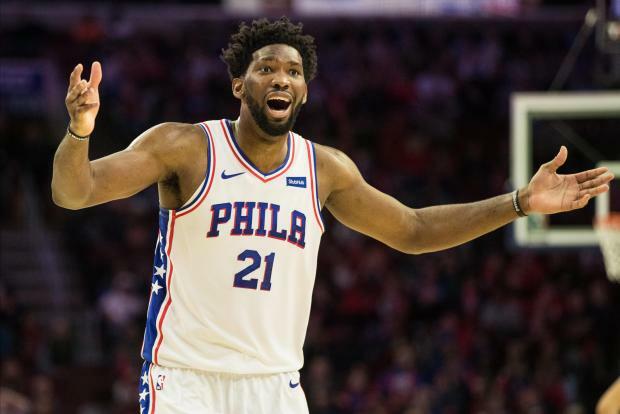 Joel Embiid had a season-high 42 points to go along with 18 rebounds and four blocked shots to lift the Philadelphia 76ers past the visiting Charlotte Hornets 133-132 in overtime Friday night. It was the eighth game for Embiid this season with at least 30 points and 10 rebounds. Ben Simmons racked up 22 points, eight rebounds and 13 assists, Dario Saric added 18 points and nine rebounds while JJ Redick added 17 off the bench as the Sixers improved to 7-0 at home for the first time since 2002-03. Kemba Walker scored 22 of his 30 points in the fourth quarter and overtime as Jeremy Lamb added 17. Dwayne Bacon scored 15 for the Hornets, who had their two-game winning streak snapped. Joe Ingles tied a career high with 27 points and Rudy Gobert added 17 points and 15 rebounds as the Jazz spoiled the return of Gordon Hayward to Utah with an energetic victory over visiting Boston in Salt Lake City. Jazz fans booed every move of Hayward, who left Utah for Boston via free agency before the start of last season. Hayward then suffered a fractured ankle injury in the Celtics' season opener last year and did not play the remainder of the season. He scored 13 points on 3-for-9 shooting from the field. Donovan Mitchell had 21 points, former Celtics forward Jae Crowder scored 20 points and Ricky Rubio added 17, as the Jazz won consecutive games after losing four in a row. Ingles added five rebounds and seven assists while going 10-for-14 from the field, including 5-for-9 from 3-point range. Caris LeVert hit a jumper in the lane with less than a second left, and Brooklyn rallied to beat host Denver. Left with 0.3 seconds, the Nuggets got a 3-point attempt at the buzzer from Malik Beasley, who missed it. LeVert finished with 17 points, D'Angelo Russell had 23 and Jarrett Allen scored 18 for the Nets, who have won three in a row and four of five. Nikola Jokic broke out of a funk to score a season-high 37 and tied a career-high with 21 rebounds, but Denver lost its first home game of the season after winning the first six. Andre Drummond had 23 points and 11 rebounds to lead the way as Detroit jumped to a 24-point lead late in the first quarter and coasted to a victory over host Atlanta. The Pistons made a season-high 20 of 47 attempts from behind the 3-point arc and rolled to their second straight win after a five-game losing streak, despite just six points from Blake Griffin, their leading scorer at 27.3 per game coming in. He missed eight of his 10 shots, but had nine rebounds and nine assists. Stanley Johnson had 22 points for the Pistons and Langston Galloway scored 16 as the two players combined to hit nine 3-pointers off the bench. Orlando prevailed at home over Washington in a matchup of the worst offense in the league against the worst defense. Orlando came in averaging only 101.3 points per game, but tied its season high in points and shot a season-high 51.2 percent from the floor -- only the second time it had made more than 50 percent of its field goals this season. Nikola Vucevic led the way for Orlando with 21 points and 14 rebounds, and Aaron Gordon scored 20. Magic rookie Mo Bamba made 7 of 8 field goals, including a 3-pointer and three long-range jump shots. The 7-foot center had 15 points in only 17 minutes. Willie Cauley-Stein scored 25 points to help Sacramento to a victory over visiting Minnesota. Iman Shumpert scored 17 points, De'Aaron Fox had 16 points and 10 assists and Buddy Hield added 15 points and 10 rebounds for the Kings. Nemanja Bjelica tallied 14 points against his former team. Karl-Anthony Towns established season highs of 39 points and 19 rebounds for the Timberwolves, who completed an 0-5 road trip. Derrick Rose added 21 points and Jimmy Butler had 13 for Minnesota, which has lost all eight of its road games. Bojan Bogdanovic hit a go-ahead 3-pointer with 56.5 seconds remaining, sending Indiana to a victory over host Miami. Myles Turner and Victor Oladipo also buried key shots, as the Pacers rallied from a 102-98 deficit by scoring the game's final 12 points over a stretch of 1:26, snapping Indiana's two-game losing streak in the process. Hassan Whiteside had 11 points and a game-high 20 rebounds for the Heat, which saw a two-game winning streak come to an end.